For the first seventeen years, Colleen Haggerty’s life was, for the most part, what one would call “normal.” Regular. At times, even prosaic. Yes, she’d lost her father a few years earlier – and much too young – and though sad, Colleen had continued on, indulging her love of theatre by trying out for the school play, researching colleges, and dreaming of the day she’d marry and have a large, tight-knit family like the one to which she belonged. And then Colleen was struck by a car, and her left leg was torn from her body. And then nothing was ever really the same again. 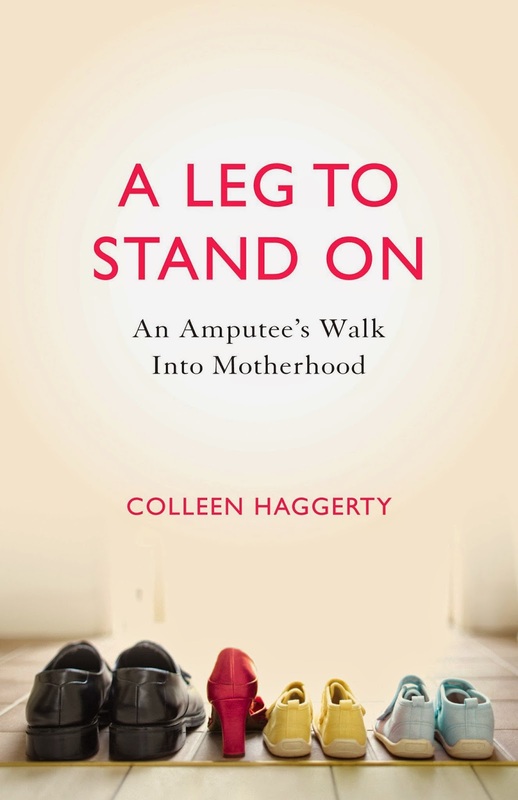 Colleen’s book, A Leg to Stand On: An Amputee’s Walk into Motherhood, traces her journey from life as an average teenager in Washington State to life as a mother of two tackling motherhood – a job that is hard enough for those of us with two legs. Although the title of the book places great emphasis on Colleen’s role as a parent, much of the book is dedicated to time between her accident and the time when she becomes a mother. Not surprisingly, Colleen’s road is rocky and often exhausting, both physically and emotionally. But Colleen’s challenges aren’t always predictable. In fact, Colleen only briefly discusses the expected physical difficulties connected to her recovery, choosing instead to focus upon the emotional battles she waged – often with herself. At first, and most understandably, Colleen wanted to hide from the world. She struggled resuming her regular activities, like school and the play, in which she’d won a featured role. Her mother and teachers pushed her to resume some sense of normalcy with an urgency that would later come to haunt her. Though she grumbled and resisted, Colleen caught back up with her life and even excelled, and then in a move that surprised me, she switched tracks and began to seek out almost unfathomable adventures: downhill skiing and field soccer alongside other amputees. Colleen’s choices of activity reflected less her deep craving for adventure or even normalcy and more her desire to connect with others who had lost limbs and kept going. But more than anything else, Colleen wanted to be a mother. She feared her sometimes limited mobility would make that difficult, if not impossible. And yet, in the end, what complicated motherhood most wasn’t Colleen’s physical limitations, it was those inside her own heart and head. A Leg to Stand On allows the reader to follow Colleen as she comes to terms with the fears that chased her from an icy highway in Washington and dogged her throughout her life, until she finally faced them head on. Interwoven in Colleen’s painfully honestly tale is a thoughtful subplot regarding her relationship to her God and her religion, one that took a big hit after her accident and which continued to suffer for years. But my favorite part of Colleen’s story centers around her relationship with Harvey, the man driving the car that struck her when she was just a teenager. Colleen’s relationship with Harvey is moving, if not unexpected and, in the end, it ends up being perhaps the most important one of her life. A Leg to Stand On is about choices: the ones we make and the ones made for us by others, or even by circumstance. It’s about survival – but it’s also about so much more. It’s about falling down – sometimes literally – and getting back up and walking onward, ever forward, no matter how difficult, no matter how much we may not want to. Thanks to BookSparksPR for the book in exchange for an honest review. Denise De Fabio Keliuotis is a Chicago native who sometimes lives in Tennessee with her husband and three daughters and sometimes lives in the Chicago suburbs (it’s a long story). Since her last guest review, she has added a new cat to her already alarmingly large collection, bringing the total to four. She’s still licensed to practice law, and she’s still editing that book she’s been writing. You can find her at her blog. Thanks for the wonderful review. This book sounds like it was very moving.